Who says you can only wear diamonds and pearls to the opera? With Ziad Ghanem there are no rules to fashion. Ziad likes to bend the rules and turn couture on its head; while you can find dramatic, voluminous gowns in his collection he also gives wearable, ethically sourced fabrics his undivided attention. Ziad combines his cutting edge couture skills with easy-to-wear fabrics and raw street elements. Established as a ready-to-wear designer for both men and women Ziad’s uber underground label is breaking new ground with bespoke designs, private commissions and junior line: Maiden Britain. Grinko said "Ziad's approach to fashion is very modern and unique. I wanted my accessories to be shown with his clothes to break the obvious style that my pieces are usually shown with. There are no rules when we collaborate together". Merging a kaleidoscope of inspirations and techniques Ziad’s pieces are desirably unique while retaining a staunch ethical stance. Opting to use recycled materials and eco-friendly methods ensures that each and every piece is truly original. In demand as a designer and creative visionary Ziad has collaborated with a diverse range of company’s, fashion publications and artists. 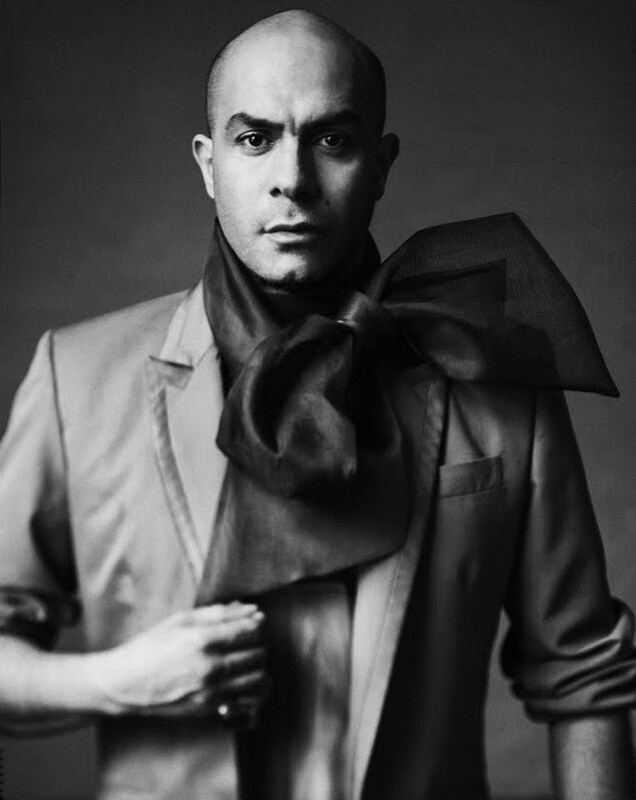 He continues to inspire and work with some of the freshest talent in the fashion and arts arena. CELEBRITIESSTYLE: When did you realize you wanted to become a fashion designer? Ziad :When I was six years old a family friend looked at my drawings and informed me about such a job called Fashion design. I immediately realized that this is what I wanted to be when I grow up. CELEBRITIESSTYLE: What drew you to fashion and specifically to starting your own line? Ziad : My mother loved dressing up and I started illustrating her in a different dress from a very young age. I started my own line because I needed a job in London and I could not get one in fashion. CELEBRITIESSTYLE: What is your educational and professional background and how do you feel it prepared you for a career in design? Ziad : Everyday is a learning process for me. I did not study fashion. I am self educated. I started working at 16 in a tailoring house in Beirut where I was trained as a couturier. CELEBRITIESSTYLE: What does fashion mean to you? Ziad :"Fashion" is the word I write before "Designer", in application forms as my job description. I love clothes. I disagree with many things that fashion stands for. CELEBRITIESSTYLE: What was the first article of clothing you ever designed? Ziad : A tube dress made out of 12 vintage Tee-shirts. CELEBRITIESSTYLE: How long does it usually take you to construct a piece? Ziad : It depends on the design and the material. But my Work is very peculiar and very time consuming. Usually I print all my fabrics individually. I even think about the right lining for days. CELEBRITIESSTYLE: When you create something, what goes through your mind? Ziad : First who is going to wear this. I am a people person I care to make my client happy and feel at ease and comfy. The first thing I draw on a sketch is the face of the model before the dress. Eyes are important. I love drawing the eyes. CELEBRITIESSTYLE: what are the accomplishments you are proud of as a designer? Ziad : I am proud of the fashion show and project I did with the 'Cherry Garden School' for children with special needs. Each kid was assisted to designed their own dress and model it in a school catwalk. Those kids are amazing and the ideas they came out with are great. I feel so proud and inspired. CELEBRITIESSTYLE: Your Choices for Models are always unique and have a story behind it, how do you select your models? Ziad : My life will be easier if I used one size block (standard fashion model size) ,I like to dress real people, I am bored with the super hero image that real models project. Making the designs for the show is a challenge. The fittings are hard work due to the variation of the model sizes. My models are very important to accomplish the design too. They are my treasure. I love working with models that love to wear my clothes. My models love my work and normally contact me asking to model. CELEBRITIESSTYLE: I always saw your design with unexpected fabrics and materials. What are your favorite fabrics to work with and why? Ziad : I love painting and coloring my fabrics. I love the three dimensional effect in prints. My Favorite Fabric is crêpe marocain by Abraham and I'm ashamed to know that the company closed down. I am saving my stock for the connoisseur client. CELEBRITIESSTYLE: What matters to you most as a fashion designer? Ziad : First what matters is the fit and the texture feel. I want to flatter the figure. Then the fantasy comes after. CELEBRITIESSTYLE: How would you define your personal style? Ziad : You can define it as Norma Desmond meets Cristiano Ronaldo. CELEBRITIESSTYLE: Your dresses are visions, beautiful and spectacular, how do you gain inspiration for your designs? Ziad : Thank you so much I am flattered. I am mostly inspired by films and by the people on the streets. I work on my collection like a film director. There is always a story to tell. CELEBRITIESSTYLE: I have always wanted to ask you. What muses Ziad Ghanem? He laughed and said "Life and the Human behaviors." CELEBRITIESSTYLE: in essence, how would you describe yourself as a designer and the designs you create? Ziad : I am the only designer in the world that can make you a dress that pleases your mother, your grand father and still appeals to youngsters. CELEBRITIESSTYLE: What are you currently working on? Ziad : I am working on a Wedding Dresses Collection. It will be launched next month. CELEBRITIESSTYLE: How do you intend women to feel when wearing Ziad Ghanem Designs? Ziad : I intend women to feel Comfortable, Confident, Beautiful like a Princess in a fairy tale. CELEBRITIESSTYLE: being a Proud Lebanese Designer how does your culture inspires you and reflects on your Creations? Ziad : I am a proud Arab. Arabic culture is so rich and fascinating but still under rated. I am very inspired by the Arts and the History of the Middle East. I am only very Lebanese when it comes to snobbism and the drive to successfulness. London Fashion Week AW 2011/12 " NEVER END NEVER END NEVER END"